When you’ve been through a major, life-changing event, it’s only normal to spend time getting over it. But when you’re OVER getting over it, and want to find happiness again, how do you do that? Well, this August, your days of wondering and struggling are over. My friend Lois McCullough has put together an amazing online event, with 21 loss and happiness experts, who will inspire you to bring happiness and joy back into your life, and to move forward from now on, with renewed energy and a greater sense of purpose and fulfillment. 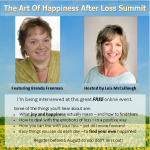 I’m excited to be a guest speaker as part of The Art of Happiness after Loss Summit, http://bit.ly/1squJ9a and I can’t wait for you to join me! The 21-day online tele-summit event begins on August 1st, and it’s FREE! When you are ready to get back into a joyful life, it’s nice to know there are others out there who are ready, and eager, to support you. Lois has found 21 of the kindest, most generous experts in the world who understand what you’re going through, and are willing to help you. Embrace life again, and find all the joy and happiness you deserve. Remember, today is the beginning of the rest of your life! Good post! Looking forward to it. Do you use Twitter? I’d like to follow you. I’m definitely enjoying your blog and look forward to new updates. matter, and your website came up, it seems good. This has peaked my interest. I am truly looking forward to this. I definitely love this website. I didn’t expect to get as much as I did out of your interview from this summit. I enjoyed listening to your interview. You post very interesting content here. Your page deserves a much bigger audience.